In 2010 I joined the Board of Directors of the Vegetarian Society UK – the world’s oldest, founded in 1847, and still going strong today. Sadly I don’t get paid anything other than expenses - no doubt if I was a director of a junk-food firm I’d be paid millions, but such is life when you’d rather do something useful. I go back a long way with VSUK, to sometime in the 1980s when I was running a local group which was part of the ‘nationwide network’ of more than 100 similar groups. Hazel and I were also running a veg B&B at the time so we got to know a lot of veg*ns around the country. Veg in cyberspace In 1994 I got onto the primitive version of the internet, heard about the ‘world wide web’ and downloaded one of the first web browsers. 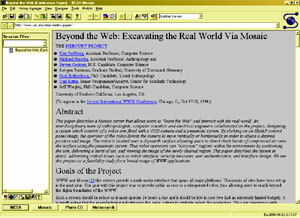 It was mostly plain text with very limited options for pictures, similar to the screenshot of the 1995 Mosaic browser on the right. Some veg*ns at three UK universities had started the world’s first veg website, running on a server owned by one, the website managed by another, and the third started putting single pages on it for each of the major veg groups in the UK – all done within the academic world as few people outside of educational establishments had any access to the internet. Which was where I came in – I took over the single page for VSUK and started expanding it. During the month of January 1995 we got 500 page views – by that summer it was 10,000 per month, and by the end of the year it was 40,000. 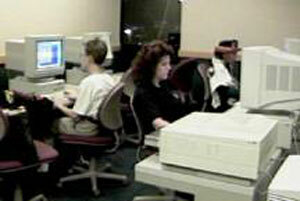 The photo right is from the cybercafé at the IVU World Veg Congress of 1996, in the USA. The machines have downsized a little since then! It was a unique experience being involved right at the beginning of something so revolutionary. We all thought this was going to have a major impact in the future, but were always up against those who wanted to keep their mindset firmly in the 20th century. It was hard to get any funding as the usual response was “what about those not online”. They didn’t believe that very soon most world would be online. By the end of 1996 the VegSoc website was up to 100,000 page views per month, and by then I had also set up new websites for some other groups, including EVU, Viva!, and the first IVU website in December ’95. But I decided to leave VSUK and the others, so that I could concentrate on IVU – I saw the future of the veg internet as global, and wanted to be a part of all that. A couple of years later, in 1999, the VSUK website was struggling a bit, and I took it on again, now at www.vegsoc.org , and was even paid a small amount now that more people were beginning to realise it might be useful after all. It was still a struggle to get it taken really seriously, especially as few of the full-time staff could access the web from the office. By 2002 it was up to 300,000 page views per month, the staff could now use it at work, and the revolution was underway. This time we did a handover session with some training so that the staff could run it themselves, I dropped out again, and have been delighted to see it go from strength to strength ever since. Meanwhile a lot of work had gone into the 2002 (all vegan) IVU World Veg Congress, being hosted by VSUK in Edinburgh, Scotland. I had put up a website and spent the week at the congress trying to make it as interactive online as possible, for those unable to attend. 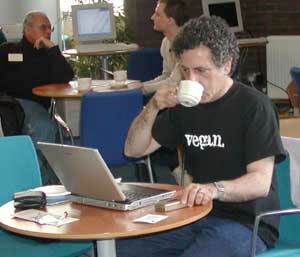 The photo right is Jeff Freedman from Toronto in the 2002 cybercafé, with rather smaller machines by then. He wrote daily articles about congress, to which I added some photos and put it all online, along with lots more photos, articles and forums. Veg timetravel During that Congress it was agreed to hold the centenary IVU Congress in Dresden, Germany, in 2008 – and I was asked to provide some historical info in time for that one. The biggest source of veg history is the library at Parkdale – so I made the hour-each-way drive one day per month for the next six years. 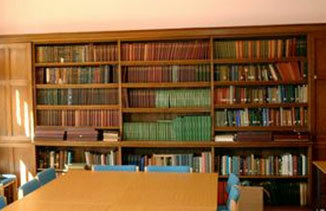 On the right is part of the library, with bound volumes of all the society’s journals from 1847, and other books back to 1819. In 2008 I was commissioned to catalogue all this, naturally doing it as more webpages. It was from here that I eventually began to discover a very different history from a vegan perspective. At the 160th AGM, in 2007, I gave a talk about how the Society’s Diamond Jubilee, in 1907, led to the founding of IVU in 1908. 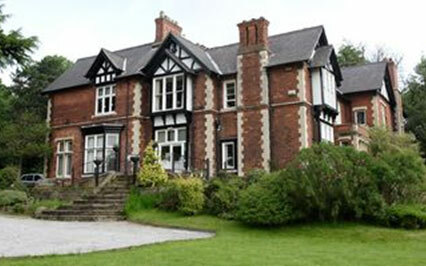 VSUK has been a leading member ever since. My latest incarnation as a ‘Trustee’ of the Society is a result of the elected board members deciding there was a gap in their knowledge of historical and international aspects of vegetarianism, and I was honoured to be asked to fill the gap.